When you think of the mainstream phenomenon that was the Nintendo Wii, people tend to remember bowling at Christmas, tennis playing grannies, and more waggling than you can shake a nunchuck at. But along with all the carnival games, inexplicable movie tie-ins, and the odd 3D Mario or two, Nintendo’s best selling home console to date also ushered in a few great cult franchises. No More Heroes – the story of how a gaming and anime-obsessed loner, Travis Touchdown, gets tangled up with a league of assassins – was one of them. More than ten years after the original, and eight years after the sequel dropped in the West, director Goichi “Suda51” Suda is back with Travis Strikes Again: No More Heroes. This Nintendo Switch exclusive is more of a spin-off than a full entry in the series and includes seven mini-games in different genres. Following the events of No More Heroes 2, Travis has sequestered himself from the assassins on his tail. But when Badman, the father of Bad Girl – a high-ranking assassin who Travis killed in the first game – hunts Travis down, they’re sucked into the mysterious Death Drive console and have to fight through a series of games to escape. In true Suda style, Travis Strikes Again is packed with crude humor, a punk-rock attitude, and tons of pop-culture references not just to movies, but Suda’s other games as well. Travis enters the action stage shown at EGX kneeling and surrounded by crackling electricity like the Terminator, while the Death Drive featured prominently in Suda’s free-to-play rogue-lite Let it Die. This isn’t the first time that Suda has been involved with smaller games, either. He worked with director Yohei Kataoka as a producer on the PSN downloadable game Tokyo Jungle, as well as writing the story for Short Peace: Ranko Tsukigime’s Longest Day. Travis Strikes Again is Suda’s return to being the sole director on a project after taking a number of executive roles, but the challenge of making seven different styles of game isn’t one that he or his team at Grasshopper Manufacture have found too daunting. 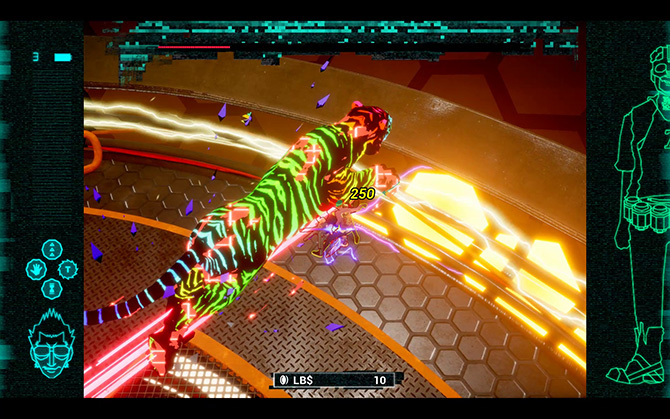 “It’s harder in the sense that there’s different systems that each game world runs on, so [there are] different atmospheres that you have to [create],” Suda says. The playable hack-and-slash portion of Travis Strikes Again at EGX was intuitive and responsive – filled with satisfying combos and silly special moves. Travis battles through waves of enemies, with Badman along for the ride if a friend jumps in via the well-integrated co-op. The controls have been simplified so that the game’s easy to play with a single Joy-Con, but it still has the same charm – these were never game you played specifically for complicated button inputs. 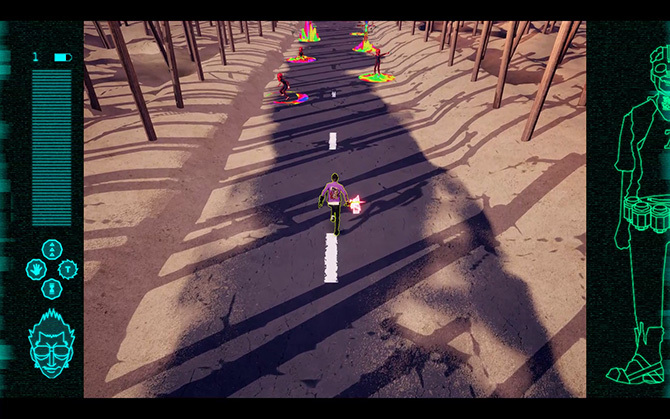 As well as the third-person action level shown at EGX, there’s going to be a racing level, as well as many others. “In addition to the six worlds (plus one), there’s also going to be an adventure mode – an old, classic, PC-style adventure mode with a green screen,” Suda says. “That will be Travis searching for the next Death Ball he needs to put into the console to activate the next game. Adding that into the total, the game should take over ten hours to complete. So, right now, what I can say is that there will also be an action-puzzle type stage, and then a pinball type stage as well. I’m also going to prepare a triple-A style area. 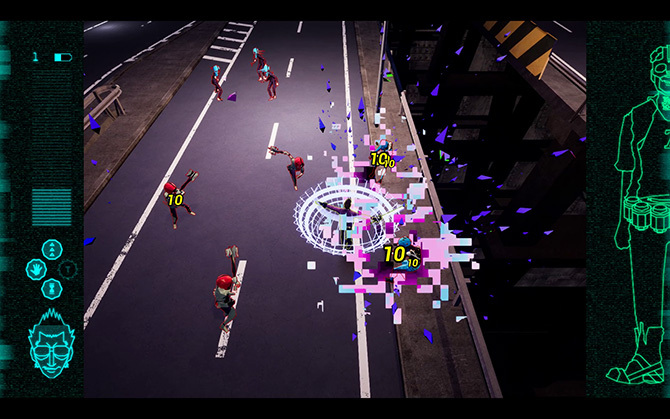 Suda hopes that this won’t just be a game for fans though, and the choice to make several smaller levels came about not just as an empty challenge, but in an effort to introduce new players to the series’ signature style. So as much as it’s a spin-off, Travis Strikes Again could be the stepping stone Grasshopper needs to produce a fully-fledged No More Heroes 3. “I wanted to make sure that the game would be accessible and that [new players] would be able to enjoy it. That’s why I decided to title it this way. “The success of this game, I’m hoping, I want to make sure that it’s a success. What it is, I want to make a proper numbered sequel. The revival is not just a one time thing. It’s a very important step for me going forward. Interview conducted via interpreter at EGX Rezzed in April.